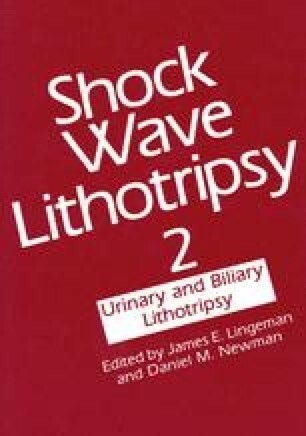 Between 1985 and 1988, 2,200 patients were treated by extracorporeal shock wave lithotripsy (ESWL*) including 42 children in the pediatric age group ranging from 3 to 8 years old. Weights ranged from 13 kg to 28 kg, and heights ranged from 82 cm to 126 cm. To make it possible to treat children of 80 cm, some technical changes had been added to the patient stretcher of a Dornier HM3 lithotripter. All patients had upper urinary tract calculi, three of them had had a previous surgical intervention, and one child had a solitary functioning kidney. The stone size ranged from 0.8 cm to 2 cm. The total number of treatments was 51, and the number of shock waves did not exceed 900 per session at 18 kV. All patients underwent the treatment under general anesthesia. The average treatment time was 25 minutes with not more than 115 seconds of x-ray exposure. Gonadal shields were used for protection against x-ray hazards. The results were much better than those of adults treated with ESWL, and there were no serious complications that required additional surgical or endourological procedures, even in patients with large stones requiring multiple sessions. The fracturization rate was almost 100%. A stone-free state was achieved in three months in 36 children (85%). Residual fragments of 4 mm or smaller were found in 7% of cases, and these cleared in five months. Transient fever caused by ureteric fragments was observed in two patients, while seven patients had post-ESWL pain. The chemical composition of stones was calcium oxalate dihydrate in 58%, calcium phosphate in 21%, uric acid in 16%, and cystine in 5%.